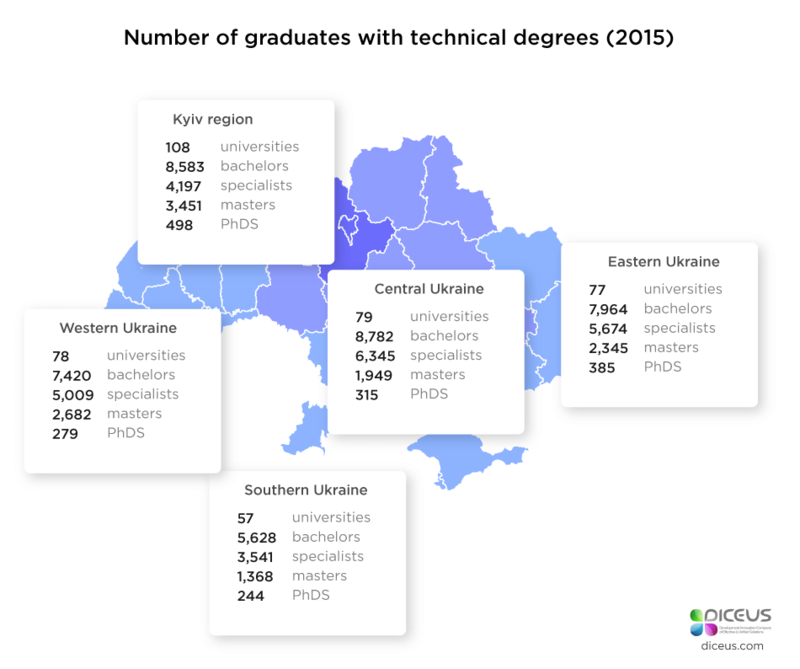 Ukraine has the biggest pool of IT professionals in Eastern and Central Europe. Now, the number of tech specialists is 90,000. Experts predict that this workforce will become more than 200,000 by 2020. Olena Minich, director of Ukrainian Economic Ministry’s department of innovations, has shared the statistics that our IT sector has 25 percent growth each year. Ukrainian outsourcing companies have gained agile approach in development and have the cheapest labor force in Europe. For example, the average salary for a middle developer is $1,600. Moreover, employees are easy to hire and retain without strong legal restrictions. Ninety-percent of web development Ukraine is focused on external markets. IT professionals have strong experience and pay attention to delivering quality services to global markets. Moreover, they’re client-oriented that make global companies want to hire web developer from Ukraine. Ukrainian IT centers are Kyiv, Kharkiv, Lviv, Dnipro and Odesa, Zaporizhia, Mykolaiv, etc. 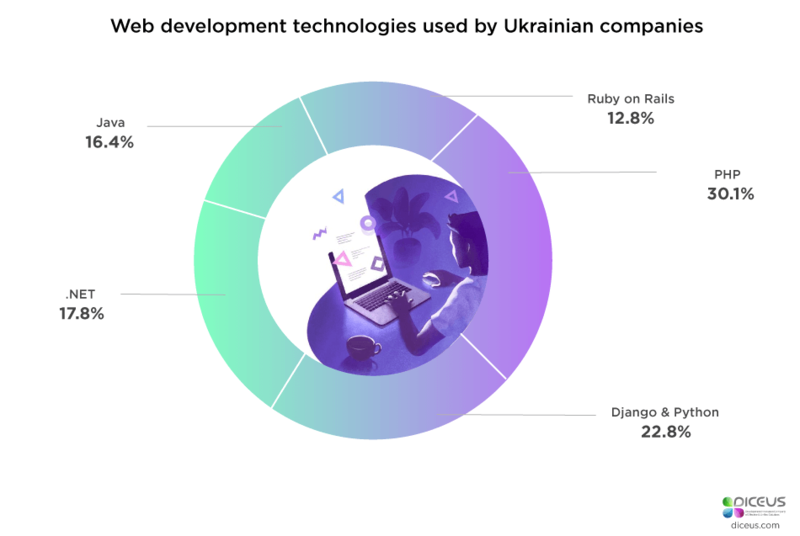 Kyiv offers the most innovative solutions, AI-driven products, and services, the newest web design trends while smaller cities have cheaper prices and simpler work. So, global clients may choose where to hire web developers based on their needs and complexity of IT services. It is hard to imagine how much IT specialists are graduated from various educational facilities each year. You may explore statistics below. Companies that want to hire web developer, have a huge range of different web development technologies to select needed one. This list is growing each day as outsourcing companies are willing to fulfill each possible business gaps. We’ve created a list of software companies in Ukraine to help you be aware of the best IT providers. Feel free to use it in order to hire web developers with deep knowledge and huge experience. It has expertise in 11 business areas in 25 countries. It is ranked as #12 on FORBES' 25 fastest-growing tech companies. EPAM Systems, Inc. established in 2002, is a world provider of web development. The company covers full-stack service of software product development involving enterprise application platforms implementation and complex software development services, support, testing, etc. Software product development services, involving prototyping, product research, customer experience design, program management, software performance tuning, cross-platform migration and so on. Custom application development services, such as user experience design, solution architecture creation and validation, development, business and technical requirements analysis, component design and integration, legacy applications re-engineering/refactoring, etc. Application testing services including test automation tools and frameworks, functional and non-functional testing, quality assurance practices. Enterprise application platforms, such as analysis and platform selection, deep and complex customization, support and maintenance. This company offers software engineering and tech consultation. It serves Fortune 500 companies with more than 1,100+ professionals from Eastern Europe and sales offices in US and Japan, Europe. This is one of the leading development Ukraine outsourcing companies by Clutch. This company offers cross-browser, user-friendly, flexible, elastic, and responsive IT services. Also, it delivers software solutions for SCM, EAM, CRM, ERP. Diceus successfully mixes the best methodologies, knowledge and expertise. Hackernoon included it in the list of 10 best IT companies in Ukraine. It works with startups from the UK, Netherland, Australia, USA, etc. They provide Android and iOS application development with difficult back-end. The IT company is located in Lviv. This company was founded in 2006 and focuses on technology stack, development methodology, service, and tools. This software development company delivers full-cycle services and focuses on innovative technologies. It is a part of Intellectsoft Group and unites various experts in cryptography, cybersecurity, and engineering in Eastern Europe. They’ve already helped many SMBs and organizations involving Nestle, E&Y, The World Bank, London Stock Exchange, Shell, etc. Intellectsoft was founded in 2007 and is focused on blockchain projects, an e-commerce tokenization platform, and a P2P and cross-border payments system. This a marketplace development enterprise that delivers services for B2C and B2B businesses. They work with such frameworks: Node.js, Meteor.js, and Express.js, React Native, React.js. Based on Mind Body Bridging principles, they create mobile apps and online programs to refine wellness, health, and human performance. It was established 15 years ago. This company is focused on therapeutic online and serves various industries related to this issue. Their applications are aimed to help users improve their health, for example, sleep better and decrease stress. Additionally, this company allows organizations reduce healthcare costs while refining employees’ productivity. These applications are easy to use, available through smartphone and cost-effective. 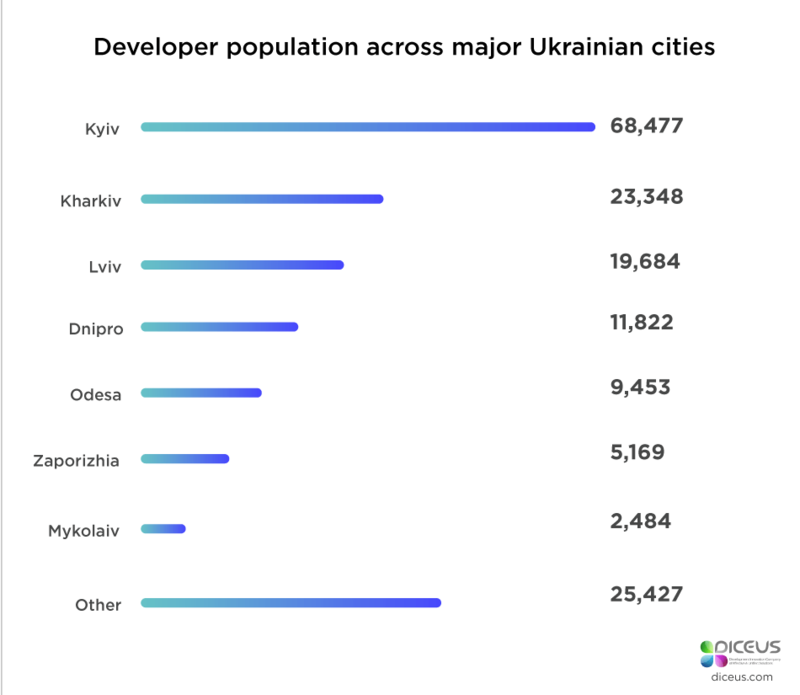 MLSDev is located in Vinnytsia and Kyiv. This company offers full-stack development services as well as design, testing and consulting. The process is based on Scrum methodology and all projects are good organized, transparent and efficient. MLSDev worked with such brands: McDonald’s, Panasonic, ESPN, etc. Miratech offers Ukraine offshore development for various companies from startups to the large organizations. It has Managed Competence Center using quality delivery models and bespoke governance structures. Besides, this company deploys culture of Relentless Performance for successful employee engagement. A fixed service level agreement connected to the entire financial performance of the company. The processes are flexible and adaptable to the customers’ needs. With offices in 8 countries, Infopulse is ready to manage information security, software engineering, infrastructure management services. With a team of more than 1,700 employees, this company gets top ranks in employer ratings. Infopulse focuses on business continuity plans with flexible approaches. They have deep industry knowledge and deliver IT services to both Fortune 100 corporations and SMEs. This company works with such industries: software & high-tech, healthcare, retail & wholesale, banking & finance, automotive, electronics, energy & utilities, etc. GlobalLogic is a full-lifecycle product development services provider. Headquarters are located in the United States, and it has offices around the world, partners in Israel. It cooperates with both startups and experienced brands. GlobalLogic is founded in 2000, now it has a team of 10,000 IT engineers. So, now you know where to hire web developers. SoftServe is one of Ukraine outsourcing companies that offer IT services, software product, and application development. Since 1993, it has international offices and development centers across Eastern Europe. If you want to hire web development team, you’ll get qualified help with the cloud, security, big data/analytics, IoT, UX design, digital transformation, etc. Ciklum is one of the IT companies in Ukraine that deliver IT solutions to Fortune 500 companies. It was founded in 2002 and covers 90% of the technology stack. The company has 1,700+ IT specialists from offices in Ukraine, Germany, the Netherlands, Belarus, Pakistan, Denmark, Sweden, United Kingdom, Switzerland. rated Best Larger IT Employer 2010 & 2011 in Ukraine by DOU. Many companies all over the world want to hire Ukrainian programmer, and this IT market overview with a detailed description of top companies will help you not to be lost. Explore these facts, outsourcing companies’ expertise to hire web development team that will make your dreams come true.